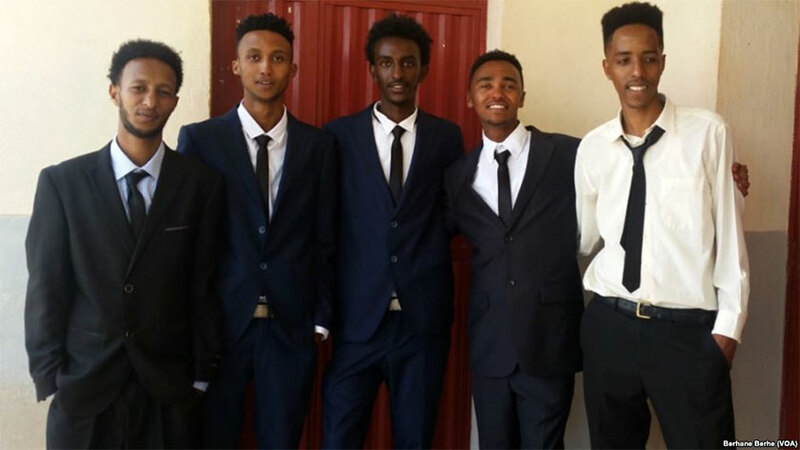 Five Engineering students from the Eritrean Institute of Technology (EIT) created a computer using a 3D printer and EdTech Lab’s Raspberry Pi. The EdTech Lab is a concept conceived as part of ICT4EEDU, the Finnish-Eritrean Cooperation Project. This project is designed and managed by ICT & Tele-Education Center of Eritrea Institute of Technology (EIT) in partnership with University of Eastern Finland (UEF). It was more than two years ago that we prepare the plan for the project, and now I get to see where we are and reflect where we need to go. 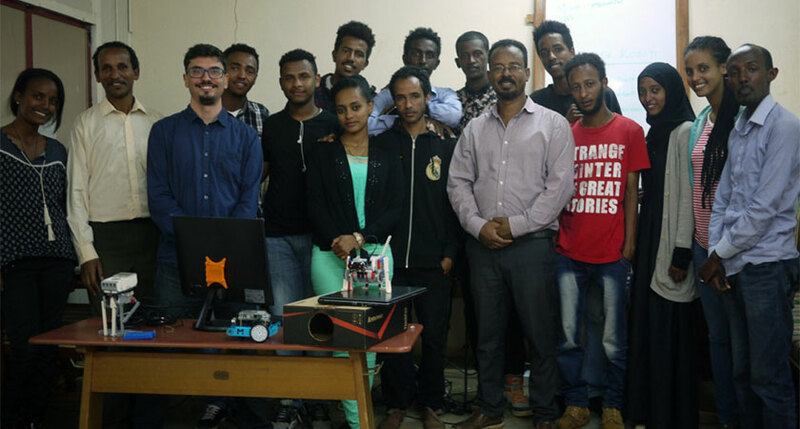 Two years ago there was not edTech lab at the Eritrea Institute of Technology (EIT). I was afraid of pushing it too much. Just because we have one in Joensuu, it does not mean that it would work here. The Eritrean context is so different to the Finnish one, so many things could go wrong unexpectedly. Two years later, I have witnessed how the EIT, its ICT Center and the Colleges are freely embracing the idea. This is partly due to the work of Marcus, Ilkka, and Samuel, who have motivated staff and students with activities and projects around educational technologies and provided a great space to do them. EIT has even hired some of the students during the summer to work on projects for the benefit of the EdTech lab and the ICT Center. Natnael from the college of Engineering has been fundamental in keeping the students active and engaged in their projects. And the students from the College of Engineering and Science have been creating artifacts, resources, and ideas I could not have imagined. One of the most remarkable projects is the “low cost low power computer”. 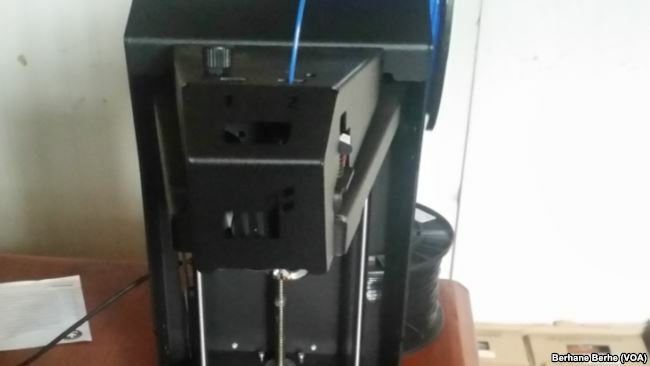 Students have used the lab’s Raspberry Pi and 3-D printer to create a computer. They even sourced a small screen to attach it to the computer. Recognizing that focusing only on the hardware is not enough, they went above and beyond to start the translation to Tigrinya of Ubuntu, LibreOffice, and Scratch. Over 50,000 strings have been translated by the students in long sleepless nights. The translation is still rough, they are not linguists, and Tigrinya, as other languages, is not prepared to express most of the expressions seen in software. From here, we call Tigrinya experts to step ahead and give us a hand in making Ubuntu Tigrinya-ready! By the way, I just heard that the students were on the national television yesterday showing their computer. INTERVIEW: Voice of America (VOA) reporter from Asmara have spoken with Simon Okubagergish, the project’s coordinator. Click the audio player to listen the full interview. One weak point at the edtech lab has been the lack of input from the College of Education, and some of the projects have lacked pedagogical direction, even if they have marveled at ingenuity and at technical prowess. We are working more closely with the three colleges to define better the kinds of activities around the lab. That way we try to get the involvement of staff and students from the three colleges, and specially the College of Education. In the summer, members of the Eritrean diaspora visited EIT, and were positively surprised to find the edtech lab, and its active projects. Interestingly, one of the visitors was involved with an American company for robotic education. For now, we have got one of their robots for the lab, but surely, in the future, we will engage in deeper collaboration, as they can be a local link for sustaining the activities at the lab. Sustaining the lab requires maintaining a community. A community that carries the institutional knowledge forward, but also commits to the daily operations. Students have been the biggest force up to now. However, they were in their last year of studies, and this year they move to their civil service assignments. Samuel has requested the commission that the lab should be assigned some of these students. We are still waiting the decision, but some have already been assigned to serve in other government offices. And just now, Samuel and I come from meeting Mr Desbele, director of the Children Educational and Discovery Center. The Center is an ongoing project that organizes yearly events similar to Joensuu’s Science Festival. The Center itself is quite impressive, well equipped, and clear focused. Thousands of kids attend with their families during the a whole week to what looks like a mix of a Science Museum and school activity room. During that time up to 80 staff members support the activities. We are already imagining joint proposals to link the activities at the lab with the center. So two year laters, the EdTech lab is a reality, and, while it still needs to mature, I could not have imagined all the activities that have happened in its short life. Eritrea is one of richest countries in human resources ,you can see simply the innovations have made in the past by Eritreans. all we need is opportunity’s for learning and budget to conduct creative workshops. Amazing! the same citizens, the same people, the same Eritrean DNA, some youth got fooled and left the country to be a homeless in the streets of the west. Some are busy in the internets and pal talks insulting and degrading their own people, their country and their own value, history. And some, they stayed home not only to be educated but to be innovative to serve their own people with dignity. One thing is obvious through, the education system must be strong; I say this for two reasons. one comparing the passing percentage with failing one is jaw drooping. only 18 to 20 % makes it to higher education. this telling me, the school system is tough. For instance, Ethiopian education system, 90% of the students makes it to higher education. to give you hint, a student who graduated with 4 years first degree, the following semester become the dean of the university in Gambela university. I believe TPLF killed everything good for Ethiopia but none as bad as the education system. There is a reason for it though, when they came to power, none of the TPLF members were educated but they assumed powerful positions. when the educated Ethiopians started to compline, TPLF went shopping for certification, degree, masters and Ph-D’s that lead to the death of the Ethiopian education system. you know It is illegal to fail a high school student in Ethiopia. the other strong evidence for the strength of the education system is that Eritrea is linked with best education system in the world, Finland! I just hope Eritrea able to hold in her youth so, her youth to become educated, productive part of her society. I am proud of those five Eritreans inventions. it is good for them, good for the country and exemplary for Africa. A good observation as well. U reminded me about a young Tigre-Guy from Barca(Tigrayit Speaker) Teacher,who exactly said in the Eri TV but is no where to be spotted for his constructive feedback! I have been saying the same thing and am glad that they are not after U for calling the spade a spade,when it comes to Education Infrastructure in Eritrea. Oops,please do not tell this to Abi! -When it comes to Creativity and Ingenuity as well as Innovation,Eritreans used to be the Engine behind the Ethiopian Infrastructure in general and in the field of Construction and Engineering,General Industry,Hotel and Tourism,Telecommunications,Airlines,Transportation….etc ..in particular . Now,check as to who is building and running the above kind of Infrastructure in East Africa and S Africa . Meaning:”The EPLF/ShAebia is/was building an Atomic Bomb in the Mountains and the bushes of Sahil”! I do not want to go into the controversial Politics of Eritrea’s Infrastructure of Education and Private Sector of the Economy but it needs to be improved and they have started doing so with the help of Finland,Kenya ,Japan and now Scotland -the home of the Edinburgh Univ . Finally there is HOPE and LIGHT at the end of the tunnel though a bit late. Make no mistake that the untold hassles Eritrea and Eritreans have to go through since 1950s and to-date have played a major negative role in keeping us behind. Surviving such a Tsunami itself is a big success ! “Manufacturing the Eri-Djibouti Conglict -a well organized and narrated Documentary here at TN or madote .com. Please post that video at awate.com tomorrow Sunday so that SAAY has to know what I told him before during our debate on this Eri-Djibouti and Somali fake story was beyond a made up story. Am sure they will be embarrassed as they might be part of that ” Conspiracy”! BTW,the ONLY /ink thing Eritreans need is a basic opportunity to work,to be creative and to do business …. just a BASIC FREEDOM of Creativity,Educationand to work and to go to school and to do business. Eritreans are the easiet people to govern as your Mentor SAAY declared! Kudos to EIT Students and Teachers for their creativity. Kudos also to PFDJ’s creativity of Sawa and now EIT at Mai-Nefhi. Million Thanks to the University of Eastern Finland (UEF). P.S. “Were Ghena”, this is just the beginning. 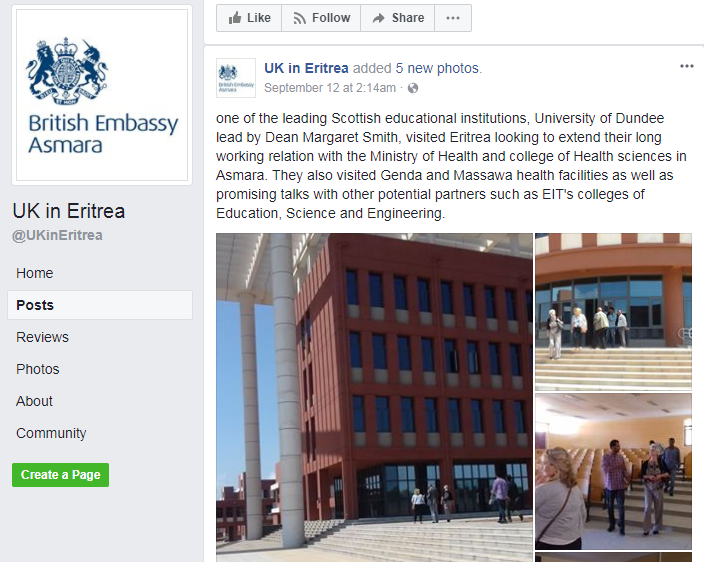 UK Embassy Asmara: One of the leading Scottish educational institutions, University of Dundee lead by Dean Margaret Smith, visited Eritrea looking to extend their long working relation with the Ministry of Health and college of Health sciences in Asmara. They also visited Genda and Massawa health facilities as well as promising talks with other potential partners such as EIT’s colleges of Education, Science and Engineering. So if they used a 3-D printer to print the casing for a Raspberry Pi board which you buy from ebay, what exactly did they create?….please have a self respect these are college students and that is what we did with my high school son! They were supposed to do more.